Finally after months of waiting, Yahoo is finally getting the chance to Live Stream the football game that the NFL promised them. On Sunday, fans will be able to watch the first live stream game ever through the Yahoo.com website services, despite it being broadcasted at 9:30 in the morning. The game will be between the Jacksonville Jaguars and Buffalo Bills on Sunday, October 25, live from London at 2:30 p.m. local time. The most exciting part for the company is the fact that this is the first time the NFL has given the rights to one of their games to a technology platform. 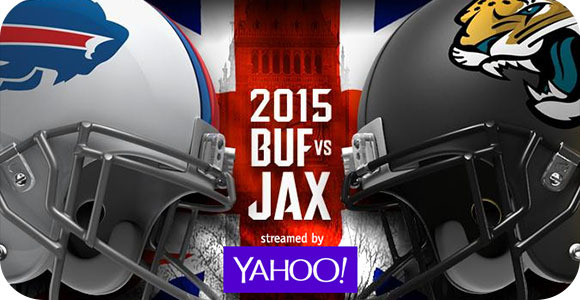 It is great news for Yahoo, as the game will not be broadcasted through TV or Cable at all, except for the local markets in Buffalo, New York, and Jacksonville, Florida. The tech company paid $20 million for the rights to stream the game, beating out other major competitors. Yahoo is not the most well-known tech platform, but it may get the boost it needs if everything goes well during their first live stream. The coverage begins at 8 a.m. ET with an hour of fantasy football discussion, including segments with Yahoo anchor Katie Couric and an interview with Buffalo Bills Hall of Fame quarterback Jim Kelly. The NFL is certainly stepping out into the future, as they are trying to adapt and change with the market and it may work out for them in the end. Let’s hope Yahoo has enough server and processing power in order to fulfill the amount of viewers they are expecting, as well as those other millions that will tune in just to watch the football game.